Victoria Day Weekend Pickle Update | Kaylin & Hobbs Pickles - New York Taste. West Coast Vibe. FIRST OF ALL THANK YOU. For all the love and support we’ve received from you guys since we opened just over two months ago. It’s been amazing seeing just how many pickle lovers there are out there who feel the same way we do about pickles, you guys are the best. LONG WEEKEND AHEAD. Just a quick note going into the Victoria Day long weekend and what to expect. As you may or may not know there’s been a couple of changes in our flavour lineup. SPICY DILL. We tested a new flavour (in a very small batch) for a limited time and it worked – for those who love a crunchy dill pickle but with a spicy finish, Spicy Dill was introduced and got great reviews. So, in pickle-fashion we’ve made a bigger batch and are bringing it back. In the meantime if you haven’t tried it get down to our Granville Island location before Friday or they’re gone. DEAR, FULL SOUR FANS. For all of you hard-core sour heads you may have noticed we’ve taken it off the menu, please note we’re working on a fresh batch and it is on it’s way to Granville next week. We love sours, you love sours, it’s all good in the hood. WHAT’S A TASTER? You asked and we listened. Starting this week we are offering a new portion size. It’s for those who can’t commit to a full quart of pickles and want a “taste” instead, it’s called the Taster and it comes in all flavours. Whether it’s a family of four who buys them for a quick snack to watch False Creek Ferries zoom back and forth at the dock, or for someone after that missing piece to their charcuterie platter, that goes with strong cheeses and sliced meats. It’s a smaller portion of pickles. It just makes sense. Ask us about it next time you stop by and we’ll pack one fresh. ON THE MENU THIS WEEKEND. 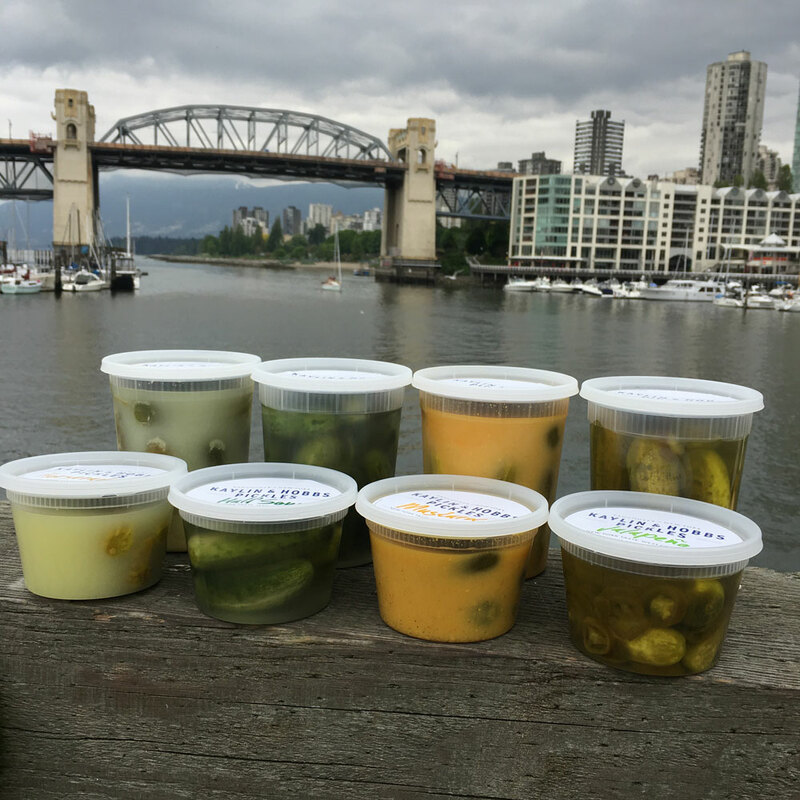 Our menu will include some of our most coveted flavours: Mustard, Kosher Dill, Horseradish, and Jalapéno. And if you haven’t tried them all, pick two and ask for them in a Taster size to go with your usual quart of Kosher Dill. NOTE: If you’re looking for Half Sour it’ll be in short supply and we could run out by Saturday. Hope to see you guys this weekend on the island!